Kunstgewerbeblatt was a decorative arts journal published in two series - vols.1-5, 1885-1889; and vols. 1-28, 1890-1917. The focus of the first series, which was printed in the Gothic script, was primarily early and traditional German art. 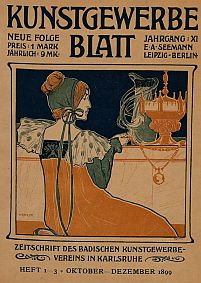 From the second series, the journal was printed in modern German script and the focus shifted to contemporary art, particularly Art Nouveau, and the German interpretation of the Arts and Crafts style. The journal includes well-illustrated articles on ceramics, glass, jewellery, furniture, metalwork, and surface decoration and, to a lesser extent, architecture. The editors of Kunstgewerbeblatt were: Arthur Pabst (October 1885-September 1894); Karl Hoffacker (October 1894-September 1905); and Fritz Hellwag (June 1908-September 1917).